Westborough, MA (July 19, 2017): The Strategic Marketplace Initiative (SMI®), a non-profit, member-driven consortium of healthcare supply chain thought-leaders, in collaboration with the Association for Healthcare Resource & Materials Management (AHRMM), has released a new career development guide outlining the vision of the healthcare supply chain leader of the future. 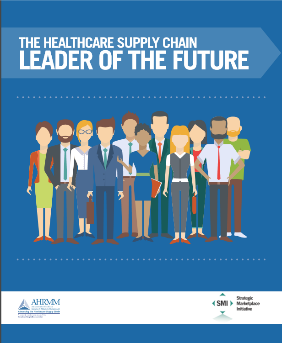 This guide, available free of charge on the AHRMM and SMI websites, is designed to help professionals understand future expectations required for supply chain leadership and to help provider and supplier organizations learn how to discover and groom the leaders of tomorrow. Recognizing the continuing evolution of the healthcare supply chain and the current challenge to develop, recruit, and retain the leaders of tomorrow, SMI and AHRMM joined forces in a collaborative effort to define the core competencies necessary to be a successful supply chain leader in healthcare. Both AHRMM and SMI conducted extensive research including interviewing current industry executives, reviewing literature and publications, conducting interactive presentations and focus groups, consulting academic resources and utilizing historical industry information. The results culminated into a comprehensive guide that encompasses four key building blocks: qualifications, competencies, experience and personal traits that define the ideal supply chain leader of the future.